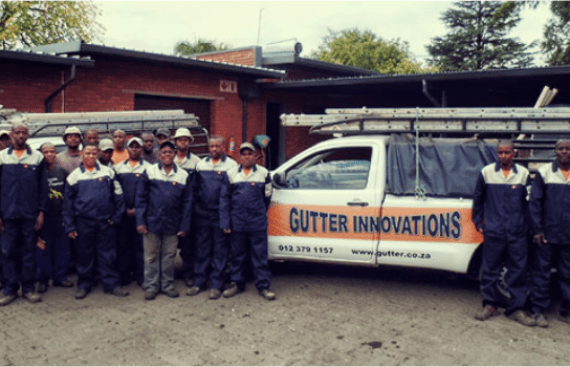 Gutter Innovations was founded in Pretoria back in 1993 and is run and owned by Adolf Ebersohn. In the last 26 years we certainly have established ourselves as one of the leading role players in the rainwater dispersal industry and the biggest segment of our work is the manufacture and installation of seamless Ogee profile gutters. We offer FREE QUOTES and outstanding customer service to all of our clients and potential clients. We have highly experienced and well-trained staff executing each installation expertly and swiftly to ensure your complete satisfaction with your new gutters and downpipes. We regard ourselves as one of the leading businesses in the rain gutter installation market. Our main focus is the manufacturing and installation of Ogee profile seamless rain gutters. Our seamless gutters are fabricated on site in continuous lengths through our gutter machines housed in mobile factory units. All fabrics used are guaranteed for 20 years. We pride ourselves in offering outstanding customer service to all of our clients and realize that each client may be a remarkable wellspring of referral business to our organization.